If you're a social media user, you've probably seen sponsored posts from celebrities and users with a high following. Consumers on social media are exposed to 'micro-marketers' that don't disclose of their partnership with a product or service. Problem arises when the 'micro-marketer' and sponsored company doesn't fully disclose of the product endorsement and the fact that their post is an advertisement. In accordance to the Federal Trade Commission (FTC), companies using endorsements on social media as a form of advertisements must follow disclosure guidelines. Micro-markets are fairly new to social media. Popularity for micro-marketing is increasing because a company is able to target more precise demographic and psychographic population online. Once the company reaches the intended audience, the companies sales are likely to rise. A micro-marketers main focus is to promote a product over social media. This is appealing towards consumers because they see an actual person that uses the product and can vouch for its benefits. Micro-marketers use social media because it's the closest connection a company can have with consumers unaware or interested in their product. Many micro-marketers don't follow the FTC guidelines, which require that the product endorsement must be clearly labeled as an advertisement or sponsorship. Not only does this goes against government guidelines, but it may create a negative light on the company being endorsed. For example, celebrities and popular bloggers are notorious for not clearly stating in their social media caption when they're endorsing a product. It confuses the consumer and isn't transparent. Overtime, the consumer may feel as if they were taken advantage of online and this can result in a decrease in product sales for the company using micro-marketing over social media. 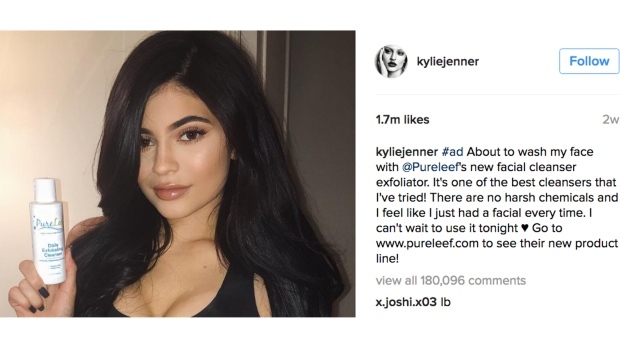 Kylie Jenner's Instagram post above is an FTC approved micro-marketing sponsored ad. The first word in her caption is "ad", which clearly states to the consumer that Kylie is getting paid to sponsor the facial product. As you can see, the ad received nearly two million likes, which generated revenue for the product. But, less famous social media users are being targeted to sponsor products that don't explain to their followers that their post is in fact an ad. This manipulates the consumer and can be viewed as dishonest. Marketers don't see the micro-marketing via social media slowing down any time soon. In fact, it will continue to generate high profits to businesses. As a consumer of social media, I don't want to feel manipulated and question whether a celebrity I admire is sponsoring content or if they genuinely like the product. The FTC and businesses must crack down on how they monitor micro-marketing content. Businesses should inforce an ethical contract. The micro-marketer can sign it to state that they agree on how to accurately promote their social media post as an advertisement. This will keep the business and mirco-marketer in a positive and transparent light. Ultimately bringing truth to the forefront.